The Friends of Llanfrechfa Grange Walled Garden is a registered charity (No. 1176172) working in partnership with Aneurin Bevan University Health Board. We welcome anyone who would like to volunteer and help with the regeneration of the garden. Please read on to find out how you can become a volunteer and some principles and rules to ensure all our supporters can enjoy accessing the garden. 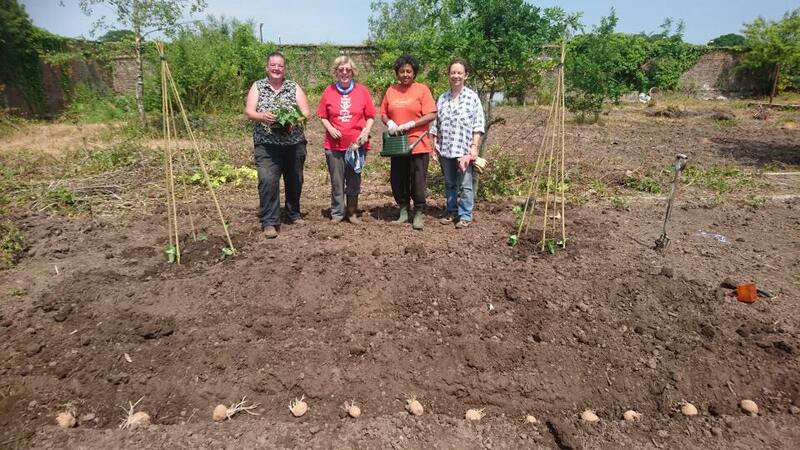 Volunteering will provide individuals with an opportunity to meet new people, learn new skills, and enjoy the social, emotional and physical benefits of regular gardening activities. Our volunteers will also be invited to the community’s garden events and an annual ‘thank you’ celebration. Anyone able to work independently in the garden can volunteer. Sessions will be supervised by one of the Trustees. Volunteers are expected to abide by the safety guidance and general principles for working in the garden. We provide sessions for people not able to work independently as part of a horticultural therapy programme with a partner provider, starting early in 2017. This is currently limited to young adults with autism spectrum disorder, but in the future we hope to extend this to accommodate other groups. Volunteers must register initially with the volunteering secretary, and provide full contact details including a contact in case of emergency.